The fear of flying (aerophobia) is an excessive worry about air travel. It is believed to affect one in ten of the population, however some studies suggest that the proportion is much higher. Fear of flying can be linked to the fear of airplanes or it could be an aspect of other psychological problems such as panic attacks, claustrophobia or post-traumatic stress disorder. People suffering from fear of flying often suffer increased anxiety and panic attacks at the thought of flying and many avoid air travel as a result of this. Those with a fear of flying commonly fall into one of two groups. Firstly, some people fear an “internal loss of control”. For such individuals, their fear of flying stems from a fear that they will lose control of their emotions during flight and therefore embarrass themselves in front of fellow passengers. For others, the fear is associated with external factors such as turbulence, bad weather or a fault with the airplane. If you can answer YES to most of the questions it is likely that you are affected by a fear of flying. Do you have high levels of anticipatory anxiety prior to a flight? Do you experience bodily symptoms prior and during flying, such as hyperventilating, sweating, churning stomach and dizziness? Do you avoid flying wherever possible, and if able to only fly under duress? Do you picture catastrophic scenes while flying that cause you significant distress? Is your fear impacting on your relationships or work due to an inability to attend holidays or meetings? Do you worry that you might lose control when flying and spontaneously open the airplane door or draw attention to yourself? This fact sheet gives a detailed overview, as well as a look at some of the evidence based approaches to treating a fear of flying. Stress Free Flying is a CD that is designed to help you enjoy a more pleasurable flight experience from the moment you decide to travel to when you touch down at your destination. You can purchase this cd from the Anxiety UK online shop here. Stress Balls are wonderful for relieving tension and pent up frustration. 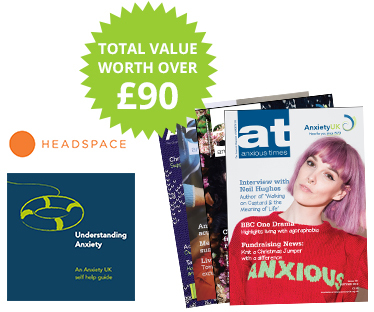 You can purchase yours from the Anxiety UK online shop here. * Anxiety UK does not necessarily endorse the services of any advertiser or sponsor on our web site.